If you’re a fan of Fatty Crab, a New York cult favorite that offers funky, Malaysian-inspired food, you’ve got to check out Fatty Cue, the new effort by the Fatty Crew to bring some Southeast Asian barbecue to Brooklyn. 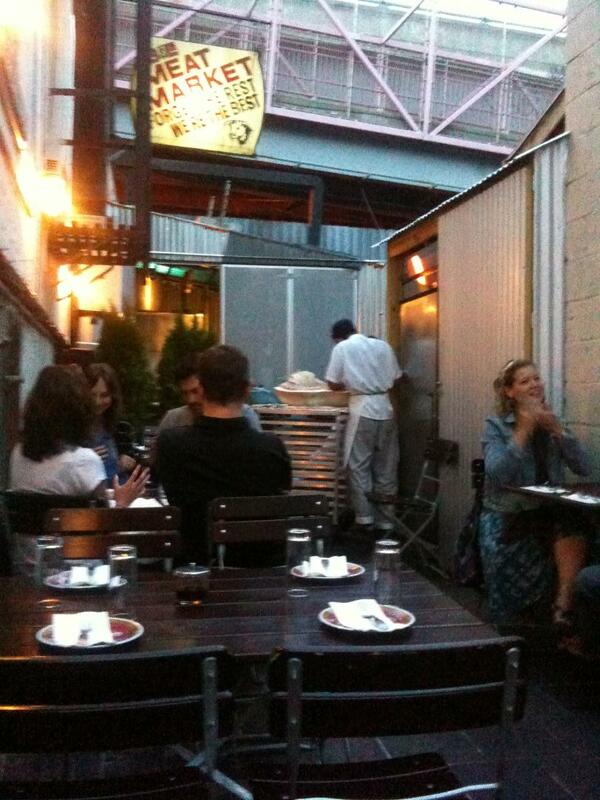 While the weather's still nice, ask to sit outdoors in Fatty Cue's "alley patio." My Trusty Sidekick and our friend, Omar, headed out to Williamsburg to try Fatty Cue because we enjoyed our last experience at Fatty Crab. While I don’t eat meat and Omar doesn’t eat pork, based on Fatty Cue’s online menu we were confident we could find a few small plates to share, and we were right. We ended up ordering a few items from their “Snack” section (these are basically large appetizers or small plates to be shared), starting off with the Smoked Eggplant Nam Prik ($12). This was an interesting Asian interpretation on dip and crudités. The Eggplant Nam Prik, which is the spread in the small bowl, has a texture similar to a chunkier baba ghanoush, but because Fatty Cue smokes all their eggplants, the flavor is incredible–like roasted eggplants times ten. Our Asian-inspired crudités included sliced veggies like pieces of bok choy and radishes, as well as slices of green mango, which was slightly bitter. 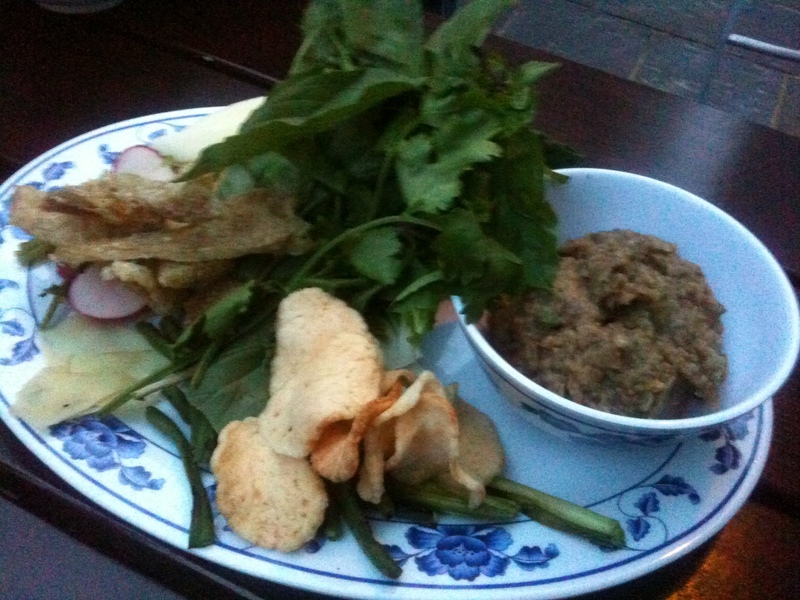 Other dipping options were Chicharrones (fried pork rinds), and Krupuk (shrimp chips). The strong aroma of the Krupuk was slightly off-putting, but I found I liked the shrimp chips best. You can see them piled up at the bottom center of the plate–they’re basically deep-fried crackers flavored with prawns, except they have a really unusual texture that’s sort of along the lines of popcorn. My suggestion is to dip the shrimp chip into the smokey eggplant Nam Prik, then add a few leaves of cilantro on top–it’s actually quite a nice bite. The fresh herb, the smokey eggplant, and the salty shrimp flavors balance each other nicely. It may not for everyone, but if you like shrimp be sure to give this snack a try. 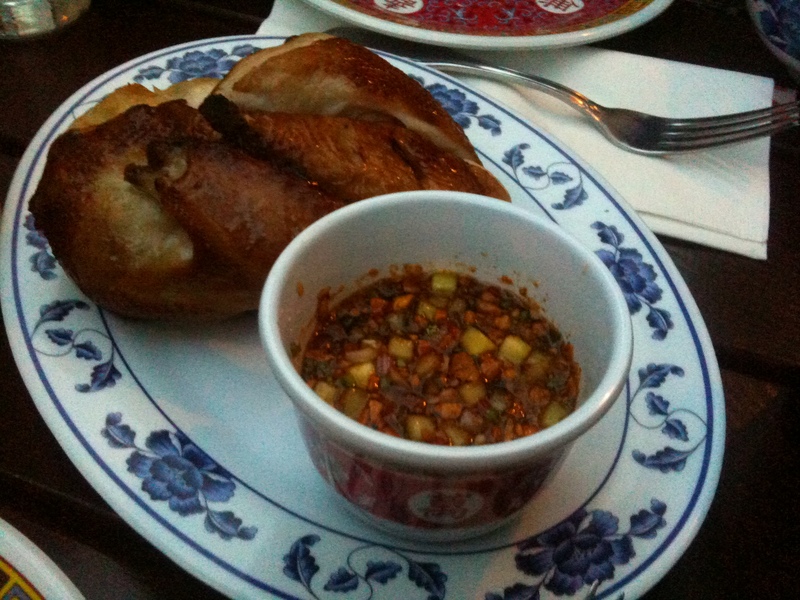 Our second snack was Fatty Cue’s Bobo Chicken, which is roasted with Asian spices like lemongrass and ginger and served with a delicious, sweet and spicy dipping sauce made of red onions, chili, and cucumbers ($16). While I didn’t try the meat here, Trusty and Omar vouched for its tastiness, raving about how moist the meat was. I can say that the dipping sauce, which I enjoyed on a shrimp chip (I had really bad breath at the end of this meal), was spectacular. I’m a sucker for sweet and spicy condiments, but this is truly one of the best I’ve tried. The diced cucumber in the sauce was a surprisingly nice touch–it added a little bit of a cool, refreshing crunch that was great with the hot and sweet combination. We ended our snack visit with some dessert by sharing two pieces of home-made pie from Allison Kave of First Prize Pies ($6 per slice). This partnership was a genius move by Fatty Cue. 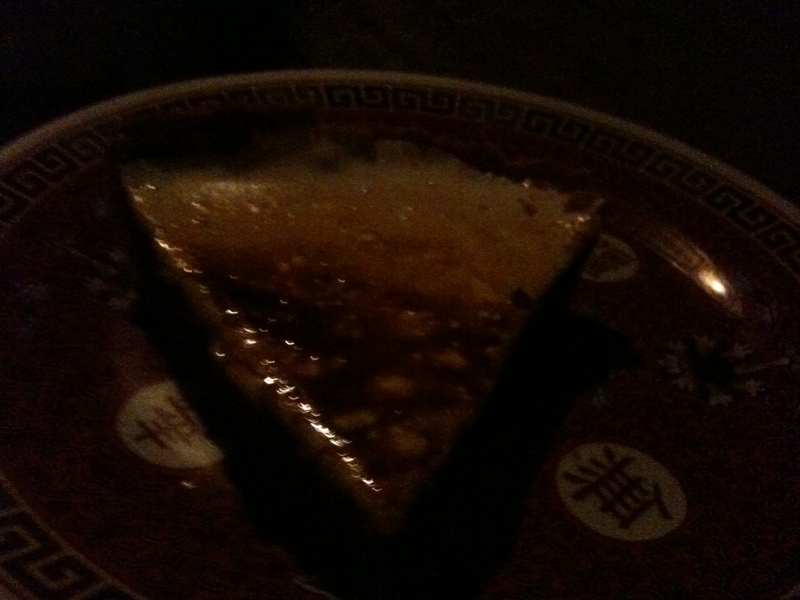 I have to say, these two pieces of pie were the best pies I’ve EVER tasted–no exaggeration. Unfortunately, because the lighting was so poor at this point, our photos didn’t come out so well, so I’m pasting some pictures from Kave’s website below. Our first slice was a piece of her S’mores pie–ooey gooey delicious toasted marshmallow over a thick layer of creamy milk chocolate ganache, all brought together with a sweet graham cracker crust. 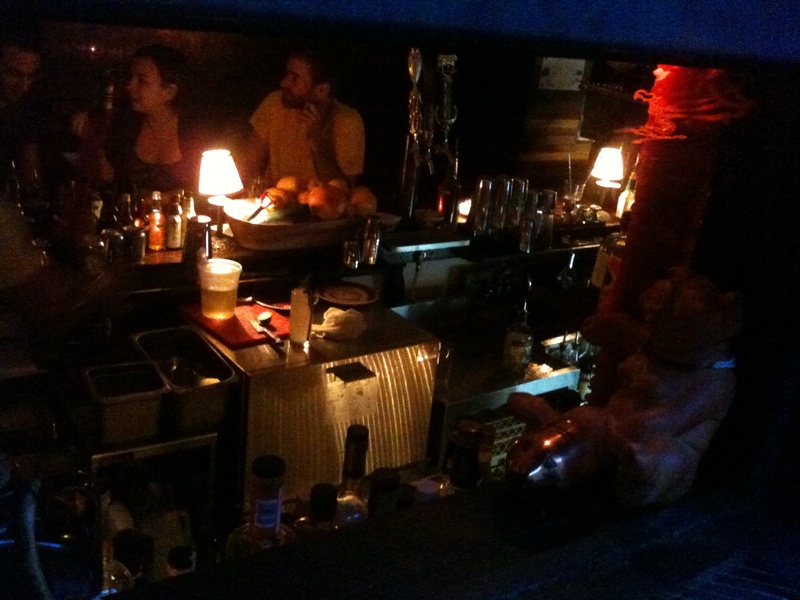 We really enjoyed sitting in Fatty Cue's outdoor alleyway. But, you can see from our photo the lighting wasn't so great at this point. The second slice was a piece of Chocolate Peanut Butter pie with a pretzel crust. So good. The crunchy, salty pretzel crunch was a great contrast to the rich and fluffy peanut butter cream topped with a thin layer of dark chocolate.